Woody Woodpecker is a very famous cartoon character with his trademark laugh “Ha-ha-ha-HAA-ha!”, an anthropomorphic pileated woodpecker who appeared in theatrical short films produced by the Walter Lantz animation studio and distributed by Universal Pictures. In Woody’s first cartoon movie Knock Knock supposedly stars Andy Panda and his father, Papa Panda, but it is Woody who steals the show. The woodpecker continually harasses the two pandas, apparently just for the fun of it. Woody of Knock Knock was designed by animator Alex Lovy and Woody’s original voice was actor Mel Blanc. Ironically, Blanc’s characterization of the Woody Woodpecker laugh had originally been applied to a Bugs Bunny prototype, in shorts such as the Elmer’s Candid Camera, and was later transferred to Woody. Audiences reacted well to Knock Knock, and Lantz realized he had finally hit upon a star to replace the declining Oswald the Lucky Rabbit. Woody would go on to star in a number of films. With his distinctive boldness and brash behavior, the character was a natural hit during World War II. His image appeared on US aircraft as nose art, and on mess halls, and audiences on the home-front watched Woody cope with familiar problems such as food shortages. 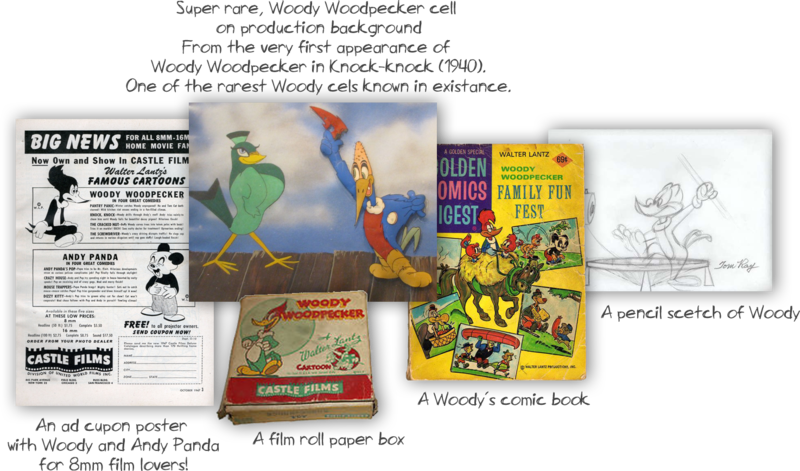 Woody Woodpecker first appeared in the short Knock Knock was as today on November 25, 1940. It’s really fun to collect comics and cartoon items and there are a lot of enthusiasts around the world that are crazy about this material!